SINGAPORE, August 26, 2015: Building on its international leadership role as a supplier of medical-grade PVC compounds, Teknor Apex Company has developed flexible and rigid formulations that address the special needs of device manufacturers. The company will highlight these capabilities at Medtec China 2015 (Stand A310). ● Alternatives to DEHP-plasticized compounds. While DEHP-plasticized flexible PVC has long dominated medical device manufacturing, Teknor Apex is prepared to supply a diverse range of non-DEHP formulations and can assist customers in choosing the most appropriate alternative compound for their application. Drawing on its unique position among PVC compounders as a producer of plasticizers, the company can provide extensive information to consider when evaluating alternatives to DEHP, including chemical structure, toxicology, solubility, migration, crazing, sterilization, mechanical properties, processing, design, economics, and current market penetration. ● Gamma-stable compounds. Teknor Apex offers clear compounds that resist discoloration and other defects upon being sterilized by gamma irradiation. Flexible extrusion grades range in hardness from 60 to 90 Shore A, while injection molding grades range from 55 to 95. Also available in gamma-stable formulations are rigid compounds for such components as tubing connectors, luer locks, valves, drip chambers, and instrument handles. ● Stress-crack resistant alternative to polycarbonate. New Apex SCR™ rigid PVC compounds make it possible for rigid PVC to replace polycarbonate (PC) in clear medical components such as connectors and check valves, obtaining comparable strength and excellent clarity while reducing or eliminating the stress cracking that often occurs in PC at the interface with flexible PVC components such as tubing. 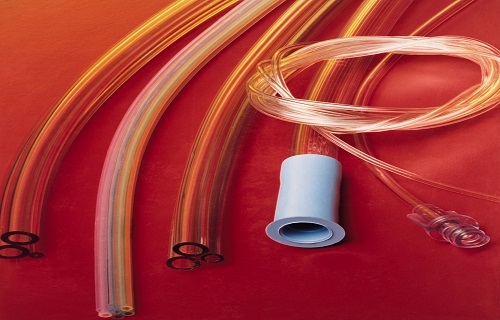 Teknor Apex’s medical-grade PVC offerings include Apex® flexible vinyl molding and extrusion compounds, Apex® rigid molding compounds, and Flexalloy® ultra high molecular weight PVC elastomers.